Creative Outlet, Healthy Food? Woo Hoo! As you know, we've really been working toward healthier eating here. We're at about 50% organics these days and almost no "packaged" foods. I cook about six nights a week now plus a big lunch on Sunday so we've also got plenty of good, healthy leftovers to snack on or make lunch from. That said, two challenges remained. 1.) Portion control. For me, that means eating smaller amounts at each sitting. For Greg, it means getting enough food into him during the day so that he doesn't scarf his weight in food at an 8pm dinner. 2.) Getting up the gumption to start packing healthy lunches for Greg again. He was up to eating out 2, sometimes 3 times a week if he couldn't find some box of leftovers sitting in the fridge. 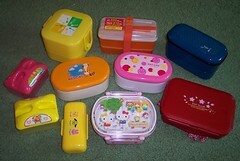 Thus started me on my journey to reading about bento boxes and bento lunches. Journey? Maybe more like an obsession. (If you haven't guess, I don't really manage to do things on a small level...) So I began reading. I began browsing Flickr groups. I began drooling over eBay auctions. I marveled at the creative food presentation and the adorable containers. Then I bought a Mr. Bento. For about a week, Mr. Bento was enough to satisfy me. Preparing lunch for Greg was fun. Plus, I was getting all sorts of healthy foods in him and packing quantities that gave him a nice sized lunch and then an afternoon snack. He wasn't coming home starving any more and I was throwing away less leftovers. Then I started exchanging some emails with Lactivist reader Abigail. Abigail is living in Japan right now. You know, Japan? Home of bento boxes and Japanese dollar stores? So what did I do? I begged her to go shopping for me. In the past week, three giant boxes have arrived. They've all been STUFFED with supplies. There were 8, yes EIGHT bento boxes. (Including an adorable Hello Kitty box for Elnora!) There were sauce containers, mini forks and spoons, side dish containers, bread and cheese cutters, food dividers, basically, boxes of bento-y goodness! As such, I found myself spending about 20 minutes each night packing bento while cleaning up dinner. 20 minutes of creativity and peace while Greg watched the kids leaving me with not only a fully packed lunch for Greg, but also a clean kitchen. It's given me reason to experiment with new foods and to find new ways to pack healthy food for Greg. We've discovered that after years of hating salads, he absolutely LOVES salads made with baby spinach instead of lettuce. I discovered kumquats and Greg discovered fresh apricots. Even Elnora is getting in on the action, enjoying sandwiches (the kid loves bread) cut into a variety of shapes. In fact, yesterday she ate her lunch out of a bento box that I'd packed for a play group that we didn't make it to. Well, if you hadn't guessed...I can never just stop at "fun." So this week, I'll be building my new site...www.bentoyum.com. (It's not live yet, so don't bother checking it, I'll let you know when it's up.) My original thought was to simply put up a bento blog with pictures of each bento and the occasional recipe or packing tip. 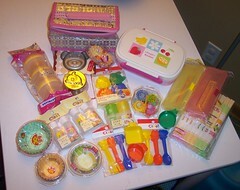 Then I thought about how neat it would be if I could convince Abigail to open shop and sell bento supplies. Oddly enough, as I was thinking that, an email showed up from her with the same idea. So Abigail and I are going to be partnering on a new business. I'll do the blogging and will help her learn about marketing and she's going to be putting together bento kits, selling bento supplies and putting together some ebooks on the subject. Should be fun, especially for those of you looking for a way to inspire some healthy lunches for yourself, your spouse or even your kid. Which leaves me with my question... Would you like the very occasional bento post here if I come up with something really cute or interesting? Should I ditch the MyBlogLog widget for a Flickr widget that rotates through pictures of the bentos? Or should I leave everything as is and just let you know when Bentoyum.com is up and running? Want to chime in with your own thoughts? Click here to comment. I'd like a simple intro to Bento'ing as I've never heard of it before yet we're always running into the usual lunch issues (who doesn't?). Don't go crazy now- but here's a really FUN website: The Vegan Lunchbox (just google it). 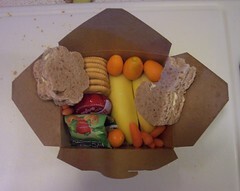 I'm not vegan, but these lunches (for a kindergartner) look great. 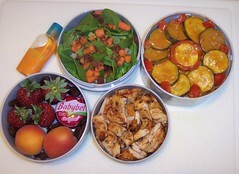 Jennifer, the vegan-mom, uses Bento too. Enjoy!! I'm not vegan, or even vegetarian, but I've spotted some good ideas there. It's cool that you are doing this, because as soon as I saw your other post with the bento link, I started wanting to hunt down a bento box. I will wait to see what bentoyum has to offer. I like Flicker widgets better than the mybloglog static thing, personally. Good luck on this project. Sounds fun. I happen to be a Flickr addict, so of course my choice is the Flickr widget. I currently have that one on my site, and I love seeing the different images pop up. This is so cute! I've been wondering what I was going to do for my oldest son who will be starting school this year. He's terribly picky and I -know- he will not eat school lunches. He saw these pictures and started talking about how cool they look and we looked on ebay for some to order and he likes the frog ones. There's a store in a local mall here that sells anime type items and I can not remember the name of it for the life of me. I was wondering if they might sell this type of thing since they do sell school supplies, toys and lunch boxes with hello kitty and naruto on them. It would be perfect if they do. I'll be checking on our trip there tomorrow. well I definitely wanna keep hearing about this- I was reading this post and was like "what the crap is bento?? is it like pemento??" I'm so clueless but it seems really cool and fun and my husband loves when I pack lunches for him- I'm definitely gonna start researching this stuff now! I would love to know, if you don't mind, how do you eat a kumkwat? I see them in the store and can not imagine peeling those tiny little things! oh, but preparing the bento does get boring for me after a while. my husband makes his own bento now! Like Damien, I have never heard of "bento'ing" before. I would love an intro too! Kumquats? You eat them whole. Peel and all. They are like the healthy version of a sour patch kid. We've been eating healthier all the time. I've been moving us to a more vegan lifestyle, although we do still eat some meat and occasional dairy. I heard about bento on The Vegan Lunchbox too! So curious. I don't quite get it yet, but I'm totally intrigued with these funky boxes and arrangements. I'd love to learn more - I'll be hopping over to that site as soon as it's up. Looking forward to it! Love it, Love it, Love it!! 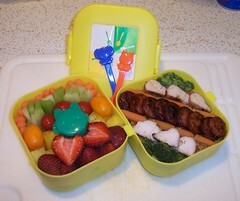 I knew a family at my children's day care that ate Bento lunches. I would LOVE to read about and buy bentos! This topic is **HUGE** for me right now. I have really gotten on a great exercise plan after recently weaning my two year old. Not really a plan but I recently began to love the way exercise makes my muscles feel ~~like they are breathing~~ *But* what I really need more of a plan is with my diet, lunches for the fam, so I think this is GREAT and I am loving the timing!! Hi Jen. Abigail's husband here. Man, you have really opened a can of bento worms! Whoathunk there would be this level of interest? I hope Abigail can keep up with all the demand :). I will certainly be savoring my aisai bento ("bento prepared by a loving wife") today, as it looks like it won't be long before I will have to be preparing it for myself as Abigail won't have the time. Here's to you guys' booming bentoo success! I'm scouting eBay for Bentos right now! In personal news, not that it has anything to do with this post, but my 2.5 year old son is weaned. :( :) Not sure what the appropriate emoticon is for this, as I'm a ball of emotions right now. Why scour eBay and battle other bento addicts when you could just wait a couple of days and buy them direct? I knew you guys would like this stuff though! Going to make a post a bit later about our trip to a historical farm today. Three bentos included since we had to take lunches. OMG, Jennifer, I'm so sorry! You got me so excited about Bento with these pictures, that I didn't even finish reading your post and went on eBay to look them up. I just now finished reading your post and realized that you'll be opening a business to sell them. That's awesome! I'll definitely wait and buy them from you. 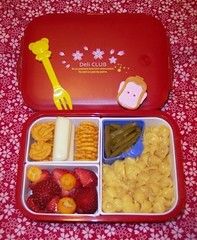 I'm looking for some cute lunch boxes for my son when he goes to preschool this fall. Just to note, you won't be buying them from ME, you'll be buying them from Abigail, a Lactivist reader that I'm partnering with. Wow - everybody's bananas for bentos! That's exciting! I'm looking forward to working with ya, Jen, and to meeting new lactivists via bentos! Will you be having some kind of mailing list? I'd love to be on it. I'm poor as dirt, but could probably manage to save up to get a few kits, and I'd much rather buy them from someone I "know" and support a fellow mom in the process than risk an ebay auction somewhere. I'd love to be on some kind of a mailing list to let me know when you're up and running. I am really looking forward to exploring the world of bento. My husband and I are ready to loose some weight, and I really want my kids to have better eating habits than we have, and this sounds like a great way to make it fun and interesting to eat healthy and simple. Can't wait for the bentoyum store to be up and running! Your previous mention of Bento had me surfing around getting info. but it quickly gets overwhelming. I'd love to read your take, and I'm hoping you'll start with a very basic beginner overview. We do pretty well with eating healthy, but the lunches for the kids are always the same thing. I also have my eldest starting kindergarten next year and I really don't want her eating the same thing five days a week for lunch! So, post here and/or there, I'll see it either way! Hmm... My first thought after reading this was that I simply must have Abigail's contact info, LOL. I LOVE bento boxes!